Richly imagined, this is an audaciously brilliant tour de force from the creator of the graphic novel adaptation of The Great Gatsby. Wherein I'll catch the conscience of the king! Denmark is in turmoil. The palace is seething with treachery, suspicion and intrigue. On a mission to avenge his father's murder, Prince Hamlet tries to claw free of the moral decay all around him. But in the ever-deepening nest of plots, of plays within plays, nothing is what it seems. Doubt and betrayal torment the Prince until he is propelled into a spiral of unstoppable violence. In this sumptuous staging of Shakespeare's enigmatic play on the page, Nicki Greenberg has created an extraordinary visual feast that sweeps up all in its path as the drama intensifies both on stage and off. An astounding work - unique, gripping and, as ever, tragic. Hamlet is not a new text by any stretch of the imagination. But the way in which Nicki Greenberg has imagined Shakespeare’s classic has breathed new life into our stricken Danish prince. For purists, comfort can be had in that Shakespeare’s tale is left unchanged and as engaging as ever – it is how Greenberg present the play that is to be celebrated. As with her adaption of The Great Gatsby into the graphic medium, from page one the reader is overcome by the consideration and sheer effort that has been put into animating the familiar characters. This works splendidly for a generation of students that are stimulated by the visual text, a generation of students that have spawned a re-imagining of many classic tales. Indeed, the transformation of Shakespeare’s works into graphic novel is not a new idea, but the scale of Greenberg’s work has gone beyond. Most editions of Hamlet are either ‘edited’ or ‘presented’ by one author or another; this edition is ‘Staged on the Page’ and it is only as you become engrossed in the play that you realise how apt a description that is. The characters move across the page as if they were moving across the Globe Theatre; a flourished crowquill emphasises a flourished line of dialogue; Hamlet’s feigned madness is stressed in his numerous (and often unnerving) facial contortions; the characters’ soliloquise at the reader, as if looking out from upon a stage. And that is where the true magic of this text originates. Greenberg has manipulated the play of ink and colour before us into something that feels like it could draw breath. You do not read Nicki Greenberg’s Hamlet; you sit in the audience of Greenberg’s production, watching as the tale unfolds before you. Hamlet by Nicki Greenberg is beautifully presented with an exciting use of colour. It goes through the full play with no abbreviations with the characters saying their lines in speech bubbles. The animations that are used to represent that characters are interesting and are animals, some more recognisable than others. The graphic representation helps with the understanding of the play, however it could be a little confusing to some students as to which characters were which. It is also a very long book, as each little exchange is in its own separate box, however, it would be useful to show some junior classes a different representation of the play. In the classroom, I would recommend that it be used with the junior classes as it takes away from the speech and assists those who are having trouble with the Shakespearean language. It could be used as an example of how to transform a text from a play to a graphic novel and encourage students to approach Shakespeare in a more positive way. I found this to be a difficult book — difficult to review, difficult to categorise, difficult even to hold for long; with its 428 hardbound pages it’s not easy to carry around! The cover introduces it as Hamlet “staged on the page” and so its opening and closing pages present as stage curtains which recur at the beginning of each scene, as with Hamlet’s embedded play in Act III. While it’s a book in full colour, the colour scheme reflects the mood of the particular section as the drama progresses — there are blue sections, red sections, grey/green sections, brown sections as well as multi-coloured ones. With brilliant irony, the author uses a familiar pen image as a sword (along with paintbrush javelins) early in the play and transforms it to a musical instrument in Act III, scene 2. Each double page spread is a work of art in itself: Nicki Greenberg employs a wide range of colourful imagery and techniques, along with sequins, beads, feathers, scraps of fabric, lace and papers to create beautiful collages through which her stylized cartoon characters glide. Shakespeare’s dialogue, though not completely included but almost so, is faithfully reproduced in lettering that is easy to read. The characters, though in many cases presented very similarly, are distinguishable and Hamlet can be easily identified in every sequence in which he appears. A beautiful book, which well repays a close reading for its imagery alone, Hamlet includes an addendum of two pages of detailed notes on each of the plants mentioned in Act IV, scene 5. While I’m not sure how many of our Year 9 students, who study Shakespeare’s Hamlet, will avail themselves of this book, I’m certain that Nicki Greenberg’s Hamlet will be very attractive to older bibliophiles. Does Nicki Greenberg sleep? Greenberg’s graphic novel adaptation The Great Gatsby was inspiring, however, in a short space of time, Hamlet appears, with such detail and obvious depth of thought. This graphic novel (all 440 pages) engages the reader from front cover to back. Every double page offers a varied array of colour, graphics and layout. The black double page at the start of the text with a simple ‘Shhh..’ prepares the reader, or should I say ‘audience’ for the play ahead. Shakespeare was meant to be viewed, so from this aspect, Greenberg’s Hamlet does just that. This truly is a viewing experience. True to the original text, this graphic novel is ideal for the classroom. No more mundane English lessons of students trying to read and decipher black and white print, this visual Shakespeare should engage the reluctant student. For the confident Shakespearean student, it encourages them to engage with the play on a more sophisticated level, particularly in the areas of staging and thematic and character representation. Greenberg also thoughtfully includes a double page at the end of the text with explanations and visuals of Ophelia’s rue, morning glory, fennelflower, nettle, thistle, etc. I look forward to Greenberg’s next release; hopefully another Shakespeare. 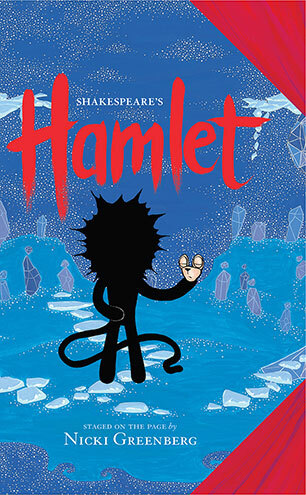 Having been deeply impressed by Greenberg’s The Great Gatsby, I was excited to read her graphic adaptation of Hamlet. Put simply, Hamlet comes with baggage—as ‘the’ Shakespearean tragedy, as ‘the’ role for actors, as ‘the’ grab-bag of quotable quotes. Well-known critic Harold Bloom has gone so far as to describe, with economy and perhaps arrogance, “Shakespeare and Hamlet, central author and universal drama” (39). So, anyone wishing to adapt Hamlet—on stage, on screen, on the page, for the ear or the eye—might well feel intimidated by not only the play but all that it brings with it after four centuries of adulation. Anyone lucky enough to read Greenberg’s Hamlet, “staged on the page”, must surely be impressed by her ability to surmount the play and its baggage in offering a clear and accessible yet dense and intelligent, adaptation which balances the linguistic and the visual to produce a text that will be a valuable addition to any and every library! Using deceptively simple figures of black ink for her characters (red for the players) Greenberg highlights the ways in which environment and personality influence our sense of who we are. Faces are literally masks here, and actions take place in and against environments more likely to be represented by shapes and colours as by particularly detailed settings. As in the best stage productions, Greenberg makes powerful but spare use of props to add layers of meaning. Graphically, the book juxtaposes organic backgrounds of bright colours and circular shapes with backgrounds made up of clockwork cogs to convey competing experiences and world-views; plays with multiple page layouts to simultaneously lead the reader on a carefully-planned journey and to ensure that they never feel entirely confident that they know where they are going next; provides enough visual material to guarantee readers’ engagement with this world, but never in such a way as to close down the possibility of readers bringing their own interpretation to bear on the book. Greenberg’s Hamlet must surely appeal to those already familiar with Shakespeare’s play and to those who may know it only by reputation. Although long, the reading experience here is never tedious nor intimidating. Teachers looking for ways to engage reluctant readers with Shakespeare or graphic novels need look no further than this volume! I absolutely adored Nicki Greenberg’s reimaging of The Great Gatsby, and was delighted when I heard that she was appropriating Shakespeare’s Hamlet into graphic novel format. What a fantastic idea, and how beautifully she has executed it! With Greenberg’s use of bold and vibrant colour symbolism, it is an enticing (and large!) book to even open. From the first page, Greenberg has taken care to fill every page with images, adding to the sense of hysteria and mental instability that dominates the story. Her representation of the characters (as large black forms) also foreshadows the events of the text, although it can be difficult to distinguish characters at times and their representations may not be as instantly appealing as the aquine figures of Gatsby. Nevertheless, the psychedelic swirls of colour and inclusion of texture are gorgeous flourishes in this fascinatingly surrealist work, and are effectively utilised to represent the mind of Hamlet. There is as much happening on the page as there is in the story! Her representation of the indecision and emotional fragility of title character is accurately rendered, albeit in a less traditional form that we are used to! Indeed, the visual elements of the text add great insight into the characterisation in this difficult play, which is one reason why Greenberg’s text is incredibly useful for lower ability students. While there is similarity in the representation of the characters, the text is ripe for discussion about visual differences as a means of representing character. It also allows for the inclusion of reoccurring motifs, such as the clock (which is used very effectively in this text) that can be lost upon reading the play itself. This is a richly textured and truly exquisite read – both accurate to the original and colourfully imaginative. Its great value is reflected in the words of one of my students, ‘this is amazing!’ This text allows contemporary students to access Hamlet in all its glory, which is something we should all be grateful for. Explore appropriations. Outline term with examples (I used extracts from The Simpsons and a range of other resources.) Ask students to create a list of appropriated texts. Project cover of Greenberg’s text on whiteboard – discuss and analyse as a visual text. Students given copy and annotate with visual techniques. Students given extracts of texts – key scenes to read and discuss. Students consider how they would ‘represent’ themselves and the characters of the text. Is this how they imagined the characters as visuals? Contrast use of colour – early use of blues juxtapose to fiery reds later in text. Discuss the effect. Compare to The Lion King (also an appropriation of Hamlet.) What elements have changed? Which have stayed the same? Students create an outline for an appropriated film version of Hamlet. 'Staged on the page' is an accurate description of Nikki Greenberg’s graphic representation of Shakespeare’s Hamlet. From the very start of this graphic novel, the reader, or audience, feels like they are actually viewing a performance of this classic play. The audience anticipates the beginning of the play with a blackout and the hushing ‘Shhhh...’ of the audience. The play commences and the audience is struck by the powerful use of colour throughout the re-telling of this play. Nikki Greenberg’s Hamlet is an engaging classroom resource. It would appeal to familiar and confident readers of Shakespeare as it is faithful to the original text, but it is also very accessible and would engage those reluctant Shakespeare readers. This book would not only be a wonderful resource for studying Shakespeare but could also be utilised in other units of work, such as, the teaching of appropriation and visual literacy. Nikki Greenberg’s imaginative and bold visual style would make it a fantastic visual literacy resource. Nikki Greenberg’s The Great Gatsby and now Hamlet are visually stimulating texts that are wonderful classroom resources.